I got up and walked Mix before breakfast in the farmhouse where I was joined by Tom for a cup of tea. Soon we were at work putting on the roofing felt. 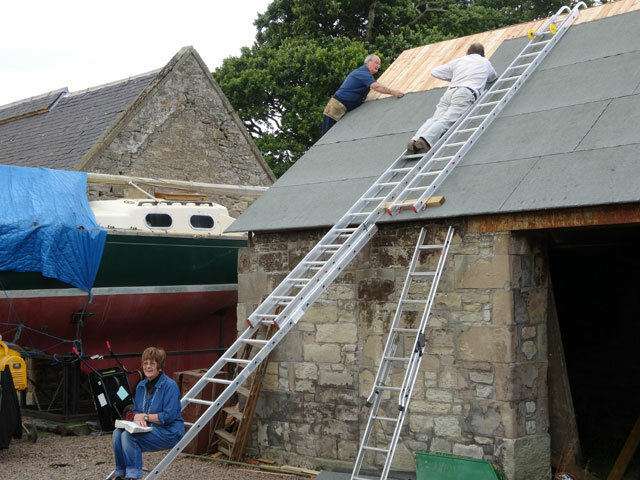 David arrived and joined in and Rachel was recruited to help us anchor the ladders which were inclined to move on the gravel in the courtyard. We made good progress and by the middle of the afternoon we had all of one side completed apart from the ridge piece which will be the last to go on. We had to stop because of the forecast storm which was clearly imminent and, indeed, it arrived to an accompaniment of thunder. Tom went off home with Spike who had been spending the day with Rowan and Mix (they all got on like a house on fire) while David did some work on the electrics in the Stables before stopping for a coffee before going home. I would like to have followed some of the cricket but the Test Match was badly disrupted by rain, and Durham (who were playing Glamorgan) only managed 185 in a fifty overs game (and were out after 45 overs). Durham are not having a good season at all. In spite of that, they did manage to win this game, bowling Glamorgan our for just 133 and reminding me that a first innings score cannot be properly evaluated until the second team has batted. We all dined together at seven in the farmhouse, after which we had a quiet evening in the Granary – what a lovely home and how pleasant to have it to retire to each evening. We watched the second part of a DCI Banks (we watched the first part a couple of days ago) and also an old Pie in the Sky which was quite fun. But I was glad to walk Mix and get to bed earlier than usual.